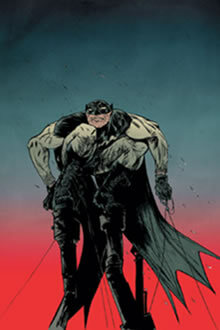 Strangely, the Year 100 trade paperback has not been tattooed with the Elseworlds tag; like Miller’s The Dark Knight Returns, Pope’s rendition is more a possible future for our current Batman. When he inevitably reaches his 100th birthday, I am confident the caped crusader will have changed little from his very first appearance. Year 100 sees the Batman of 2039 tackling a Big Brother government. In a Gotham in which every inhabitant is monitored – and Arkham Asylum was long “cleansed” – is the existence of a secret identity enough to topple an oppressive government? Pope’s art style is different to say the least, but it suits the uneven, anarchic plot perfectly. Despite Gotham’s futuristic setting – flying cars by 2039, can’t wait! – Batman’s costume is peculiarly antiquated, his wrestling boots and 50s lace-up swimming trunks complimented by an arsenal of rudimentary gadgets that would make The Goonies’ Data slick his shoes with envy. In fact, the dystopian city feels like something that Orwell himself might have envisioned; despite the omnipresent camera eyes there are scarce examples of technological advance. Less balanced is Pope’s writing. Batman’s identity, or at least his connection to the Bats we know and love, is the books strongest hook, yet Pope’s unveiling feels nonsensical and lazy. The idea of a hero’s identity being everlasting is nothing new, and has become a little tired of late. Batman’s slant is that he’s completely human; take away his frailties and his mortality away, and the character fails. Jim Gordon, the original’s grandson, adds a sense of humanity, but the Batman himself is poorly defined; slightly inhuman and ready, if not willing, to kill. Sidekick Robin is thoroughly unmemorable, and the obligatory Bat-vehicle, in this case a caped bike, novel if unspectacular. The idea of the regime fearing the revolutionary is nothing new, but Pope manages to inject a vibrancy so sorely lacking in our Batman. Year 100 is indie Batman veiled behind a mainstream cloak, about as close to neopunk comicry as the Big Two will ever print. For all its rough edges, it’s far more interesting than any other Bat book of the last few years. The book also contains Pope’s first Batman story, Berlin Batman, a fun if inessential short that sees Baruch Wane tackling the Weimer Republic in 1939 Berlin. Can’t beat a bit of Nazi thrashing, I say.